Hello everyone, welcome. Today I wanted to recount a Dungeons & Dragons game that I played recently, partly because I liked the character I created, partly as the story was cool and mostly to thank Chris for being gamesmaster – it was his first time running a game, and the mismatched bunch that we were was probably not easy to run for him. Since I have recently played a mage, a cleric and a fighter I decided to once again play something new. I decided I would play a Drow (Dark Elf) Ranger. (We are playing 5th Edition, which makes this possible without level adjustment). I created a character who was born in the baggage train of a Drow invasion that was overrun by defending humans with their allies. My character was born of the lover, or concubine, of one of the officers. She was left with the baggage train when the army fled, and died giving birth to my character. She was found by a human soldier. He took the infant, being a little bit less racist than most humans in Dungeons and Dragons, to father. The Drow woman named the child, with her last breath, after his father. 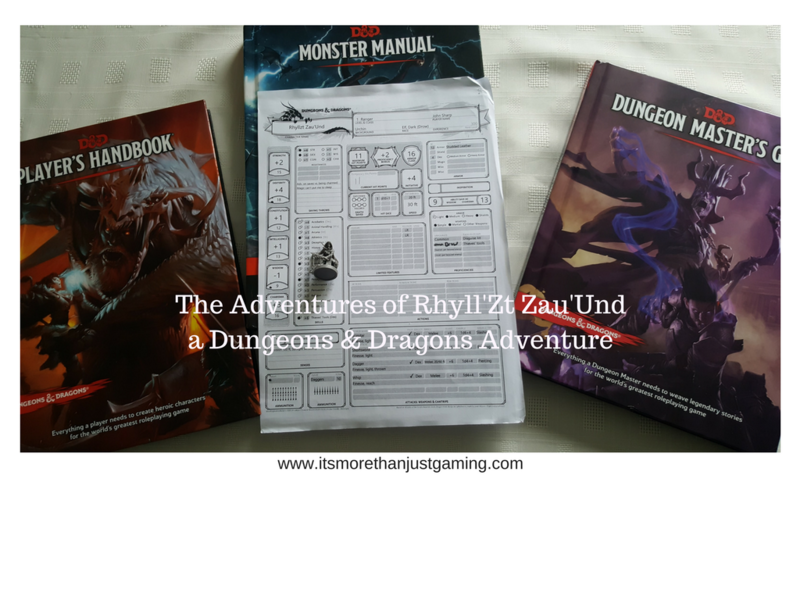 Rhyll’Zt Zau’Und. Honestly, naming the character was the hardest part of character creation. Fortunately I found a handy Drow name generator, which had prefix and suffix for both first and family names and their translations. I built the name from the translation, Moon Hunter of the Children of the Spider’s Kiss. I decided that this Drow was cared for by his adoptive parents, as the mother couldn’t have children. He and they recieved a lot of abuse from the locals of his home town, Sprig, until one night when he was 10, that the more militant folks in town burned his parents’ home to the ground with them in it. Rhyll’Zt was orphaned a second time, homeless a second time. And no good Samaritan was available to take him in this time, so he took to the streets. It was a harsh childhood, which made him hard in return. Rhyll’Zt learned to survive by his wits, learning the skills required to grab what he needed for immediate survival and to defend himself. Soon enough, folks were wary about beating him up as he was just vicious enough to win. Or at the very least, make victory too costly. The power dynamic shifted as Rhyll’Zt entered his adult years, as some of the shadier characters in town realised he could be an asset. It started as intimidation jobs, then they discovered Rhyll’Zt had a knack for finding people. He also had another talent that was important to folks in their line of work. A lack of conscience. As an adult, Rhyll’Zt makes his living in the town of Sprig, working as a manhunter for anyone that will pay. He doesn’t care, so long as the money is good. He has worked for the watch, for gangsters and private citizens with enough money to warrant his time. And that was the brief backstory I created for my Drow Ranger. Unlike most rangers, he has no bow or crossbow. He uses daggers as a missile weapon. He wields either a scimitar or short sword depending on circumstance. I wanted to make him a bit different from the standard bow wielding archetype, since he was an Urban Ranger. However, I also wanted to avoid dual wield ranger as that is too similar to the character Drizzt Do’Urden – probably the most famous Drow Ranger. Again I though about the Urban Ranger and his background as a manhunter and figured that a wielding a one handed weapon, with no shield, was most appropriate. I also gave him a whip, because people started thinking he sounded a bit like Scorpion from Mortal Kombat. The Game started with all of the charaters recieving a summons to a tavern in Sprig. The summons arrived as a note slipped under the door of my lodgings, and whilst my character does not appreciate summons, he does live hand to mouth and me the player didn’t want to be too awkward for the Gamesmaster. So, I attended the summons, bought a drink and took up a place in the tavern corner watching the door. The place was full of commoners, who gave me a wide berth since I had a reputation, plus they were racist and I was a Drow. I should point out, in character creation my friend Pete (Playing Nanoc) discovered that you could start the game with a cow. And indeed, several cows. And then he discovered hirelings. So, he decided his Barbarian, Nanoc, would be extravagant, exhuberant, stupid and have a chronicler. Which added comedy to the scene, but was also quite strategic on his part as it meant that he had a backup intelligence score higher than 7. I should also point out that the Dragonborn was also a barbarian, and Pete decided he wanted to educate the player in what being a barbarian is. So, he put on an austrian accent, acted like and idiot and used phrases worthy of an Arnie film. This was helped by the Movie night we had a few nights before where we watched Conan the Barbarian and, to a lesser extent, Predator. A human entered the bar with a list of descriptions and a bag full of stones. The descriptions were, naturally, ours. He beckoned us over, the Gnome, the Tiefling and the Dragonborn being most curious, Nanoc being curious for different reasons, and me being least curious of all but going over anyway to find out what the hell was going on (Plus that was about me the player not being awkward). The human with stones told us he had been sent by a dark hooded stranger to find us and give us a stone each. There was a fair amount of curiosity from some of the characters, and a fair amount of hostility from me. “So what, a dark hooded stranger wanted you to give us a pebble. Why should I care?” As you can imagine from my background, my character is suspicious of most things though he can turn on the charm when he needs to. He just usually chooses not to. Given the relative size and scary appearances of the player characters, the human with the list was scared of us which made me more suspicious. Then the stones started vibrating. Nanoc threw his stone away, and I backed away from the table. Of course the one that had been offered to me moved towards me, jumped at me and affixed itself to the back of my neck. This happened to everyone else. And then we knew blackness. My character pushed the human face down into the muck to confirm that he too had a stone implanted, which he did. Yeah, I know. I’m not playing a nice person. Fortunately for the terrified human it was at this point a voiced boomed around us. “Who do you need killed?” asked Nanoc. “Who are you and why should we care?” I asked. “We’d best get moving,” said the Gnome whilst I muttered something about not working for free and Nanoc shouted about sorcery, and how the best way to deal with sorcery is to kill it. The group moved down the hill and did introductions. “We are the party of Nanoc,” said Nanoc. “Yeah, whatever, the party of him,” said I. “I will see their steel, and see if it is worthy of Mork!” announced Nanoc and wandered off to the Blacksmith. Nissa was already gone, learning that there was a Jeweler’s hut. Torrin, decided to join me. Now, as a player, I am more than aware my handling of the situation was not ideal. I could have tried to cajole the man. I could have tried to bribe the man. However, that is not who I was playing. The beggar promptly soiled himself and fled. I had half a mind to grab my whip, and stop him. But I decided that he probably didn’t know any more, and slaughtering the village guard wouldn’t be a good use of my time. We chased after the Tiefling, deciding maybe we might get more from those at the top after all. Meanwhile, we had split the Party. Nanoc sought out the Blacksmith, had a minor scrap with a wooden mannequin that sprang to life (I am so pleased that will be chronicled – the stuff of legend!) and learned that the disappearances had been happening for around ten years, and that another party of adventurers tried to solve it a few years back, before disappearing themselves. He then went to the tavern. Nissa went to the jewelers and encountered the same type of manequin, but shouted, “You have a customer!” which prompted the shopkeeper to come out from the back room and deactivate the sentry. She learned more or less the same as Nanoc and Rhyll’zt though the Jeweller was interested in the stones. She sought us out at the village hall. We got to the village hall and met two more guards. Yes, he did say that. Because whilst the guards were looking for the source of the shout, I had snuck around the side of the village hall and was currently sneakily scaling the back wall. “No,” said Cassiea. Bluff check succeeded. “Oh, ok,” said the not quite convinced Guard. He ferried a message to the Headman, who confirmed he could see them tomorrow. And the heavily armed party left the village hall, without murdering the guards. Score one point for being lawful. So, the rest of the party sauntered back into the village looking for Nanoc, whom they found in the tavern where we left him. There had been enough time in the tavern for Nanoc to determine that there was something special about the water in the nearby spring; the one the village was named after. The village butcher had shown up, apron covered in blood of imported dead animal (all the local animals were missing, dead or otherwise) requiring some of the good stuff (magic water?) to get himself cleaned off. The barmaid was more than happy to sell the butcher enough magic water to do the job. Perhaps the spring was blessed by a powerful mystic and the effects of the blessing still linger. Or perhaps the barmaid has found a bottle of detergent and is scamming the village. Hmm. Let us wind time back a bit to before they got to the tavern and return to the shady looking drow doing a bit of housebreaking on the village hall. Rhyll’Zt scaled the rear wall (Athletics check with climbing kit successful) and broke into the attic. He then remained hidden and motionless until he determined that there was no one nearby. During this time he noted he was in an attic, filled furniture and stuff that Drow housebreakers are generally uninterested in. Satisfied that no one was near, and that the furniture was not relevant to plot, I snuck out of the attic through a trap door and proceeded to sneak around the upper floor until I found the Headman’s office. It had a nicer door than the others. I peaked through the keyhole and was satisfied it was empty. I tried the handle. It was locked. However, I had thieves tools and was proficient in their use. One natural 20 later and the door was opened silently and then closed and locked behind me. There wasn’t much in the office. A desk and some chairs were the only things of interest. More the desk than the chairs, I have to say. There was a pile of correspondence on the desk, along with village records. None of which was particularly interesting to me until I found a copy of a letter sent by Alonzo to a man named Col, who happened to be a prominent member of the Sprig Garrison. It was requesting reinforcements for the guard and that he dispatch investigators too. It was signed Alonzo. This told me that whilst I wasn’t familiar with the village we were close enough to Sprig, my hometown, that I would be able to return. I noted the information and began unlocking the drawers. There was one close encounter when a steward came into the office, but I got behind the door quickly enough. Truth be told I was expecting the Headman and was preparing my most convincing lie when the steward simply collected some papers and left without seeing me. I returned to the drawers and found a pot of soil and a vial of water. Me the player assumes those are clues. Me the character is looking for stuff to do with missing people and disregarded them. I secured the drawers and decided I would learn nothing else from my breakin and slipped out the window. Then, I rooted around in my pack for my disguise kit. I put a cloak over my armour and pulled my hood up, and then placed a neckerchief type thing over my nose and mouth making me look like a bandit. Or a spy. I then walked up to the guards at the front of the village hall. They were startled at my approach, but did not recognise me. “I’m here to see Alonzo about your disappearances. Tell him Col sent me.” The other players at the table burst out laughing when the guards let me walk through the front door. One conversation filled with half truths and lies later, and Alonzo was convinced we were here to help. He obligingly sent a guard to find my companions. See! It wasn’t bad news! And you probably assumed I had been caught breaking in or had killed a bunch of people. But I didn’t. It turns out Alonzo didn’t know much more. We shared what we had learned. The disappearances began ten years ago. They happen at night. They happen to people on their own. They used to happen once a month, now it is more frequent. No one has ever seen an abduction, people only hear a scream. There were some adventurers five years ago investigating. They disappeared after a few days. Possibly as a result of the problem, but not necessarily. We formed a plan. It was getting late, so a trip to the spring would have to wait. I asked Alonzo about town histories. Cassiea asked why it was important. We discovered the town was only about 500 years old and I suggested that the drop in population could be some malevolent force that formerly occupied the land wanting it back. Alonzo agreed to set his people to the task of finding the histories. Nanoc decided he was going to wait outside after dark. To be fair I was planning on using the chronicler as bait anyway, so this worked just as well. I agreed to watch his back. From inside. I an throw knives quite far, so if he was a attacked I could still intervene. And if it was a weird disappearing beam, well it wouldn’t make a difference inside or out. Nanoc took his place outside and waited. And nothing happened to him. We waited for hours watching, and then we heard a blood curdling scream. Someone had been taken from elsewhere in the village. And that was where we left it after one session. It sounds like you had a great campaign! I certainly had a lot of fun, and there are three more sessions in this story planned. I am looking forward to them! I think the person who wrote Nanoc is a genius. I’m loving how this campaign is going and admittedly Nanoc is fairly far removed from what I normally play, in that I prefer characters who are somewhat more versatile. Ultimately though, in any character generation, I end up boiling it down to three key points. 1) Purpose – what type of role do I want to play? Do we need a healer etc. 2) Motivation – now that the purpose is established, what is a very simple background of the character: Where are they from, what do they do, what do they want to do. 3) Quirk – What is a unique thing I can give them or have them do that makes them stand out. Part 3 especially needs to be checked and agreed upon with the DM. I find that while the characters that I make aren’t always great in combat or in role, but usually I find this helps them become very interesting for the DM to play with and moves the story in fun ways.